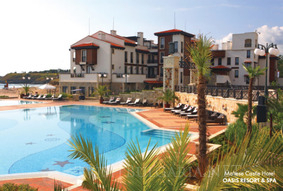 Location: Oasis Resort & spa is situated on the beach front line, in the southern part of the Bulgarian coastline. The complex is located just 60 km south of Bourgas and 450 km from the capital of Bulgaria – Sofia. It is far from industrial zones, noise and pollution. The complex is located in close proximity to Tsarevo and Lozenets Primorsko. The hotel offers 40 m wide and 500 m long beach with fine golden sand and the incredible nature of the Balkan mountain range. The region around the complex offers wide diversity of flora and fauna, as is is a natural reserve. Wine and dine: The complex offers a luxurious restaurant for 300 guests, a whiskey bar and spa centre, cable TV and high speed internet. Entertainment: The complex offers serf school, three beach bars, open air swimming pool with Olympic dimensions, children swimming pool, numerous sport facilities, as well as beach entertainments for the youngest guests. The complex also offers a shop, a coffee bar, business and internet club and a children reche.